CALLING ALL JAFFYS AND MONASH SESH HEADS! 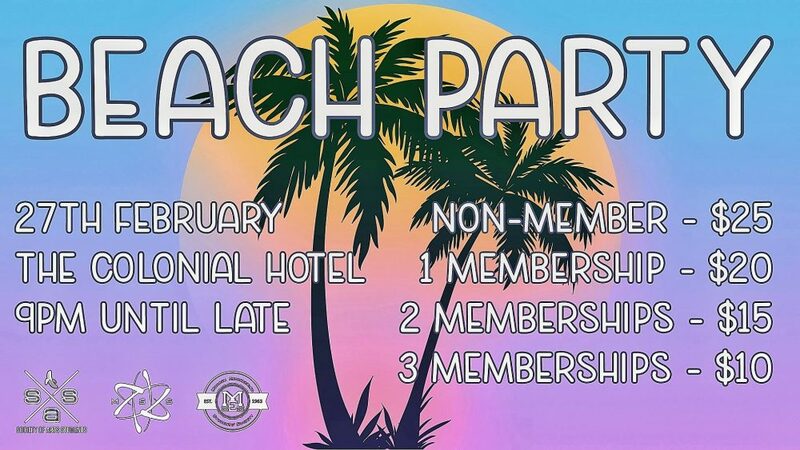 Introducing the SAS (Arts), MESS (Engineering) and MSS (Science) O-Week event, BEACH PARTY! We are talking drinks, tunes, beach balls, flamingos and even palm trees! Come and join us at THE COLONIAL HOTEL on the 27th of FEBRUARY. That’s right, it’s not quite time to knuckle down and study. It’s your last opportunity to get naughty before we wave goodbye to summer! Follow the sounds of awesome tunes and the scent of a sausage sizzle to find the SAS, MESS and MSS O-week stalls to pick up your Beach Party tickets as they are limited. Did we mention, free ZOOPER DOOPERS?